You desire to turn fantasy games into sci-fi ones is consistent, Ill give you that. 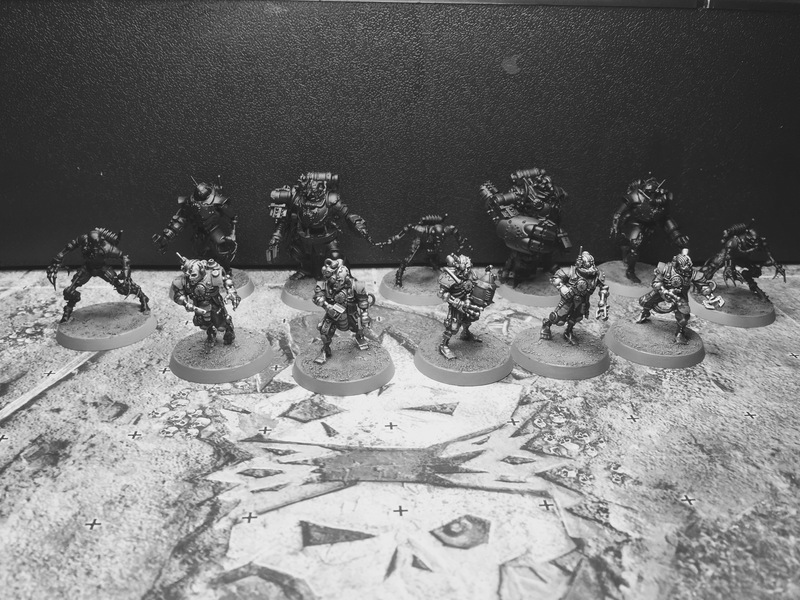 Clever but weird Blood Bowl perversions aside, I really absolutely love these. Servitors are the general purpose meat robots of the Imperium and we really should see lots of them around the place. These are really gorgeous examples too, well done. 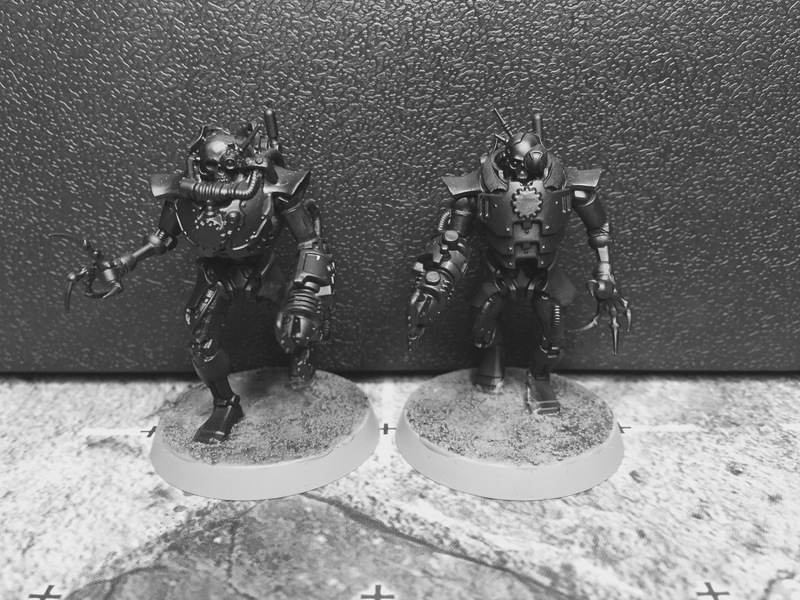 To date I have only ever painted two servitors, but the Borg influence was high, as I want to be able to slot them in as Borg if I ever manage to get some Star Trek gaming in. Brilliant mate – very clever. Absolutely agree that we should see more servitors (and servitor manned equipment) in 40k – they’re ubiquitous in the background (read a Black Library novel and you’d think that most space marines don’t actually know how to fight without slaughtering a bunch of servitors by way of a warm-up) and yet on the table they’re next to non-existent. 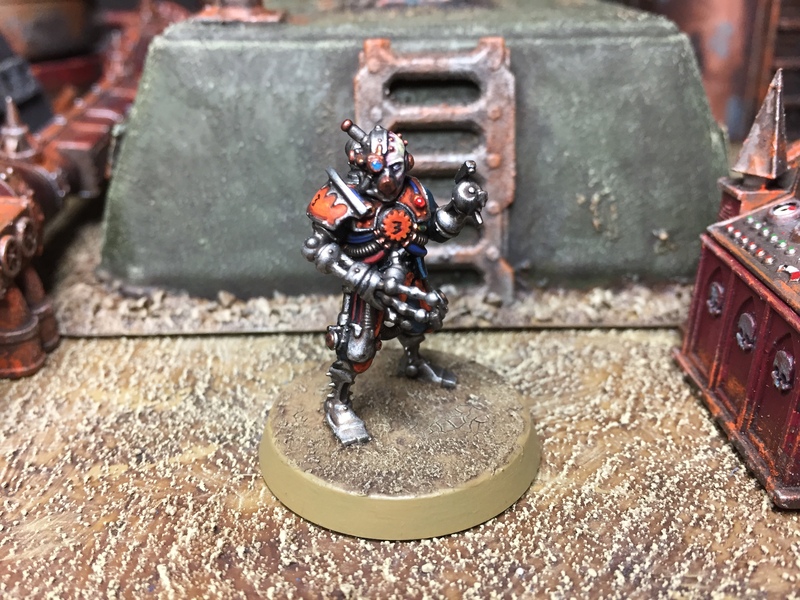 I remember years ago, long before Codex Skitarii was even a twinkle in a developer’s eye, that one of the GW old-hands (Jervis Johnson maybe??) said that if he was to work on Ad Mech he’d go to the Vampire Counts as a starting point for inspiration. 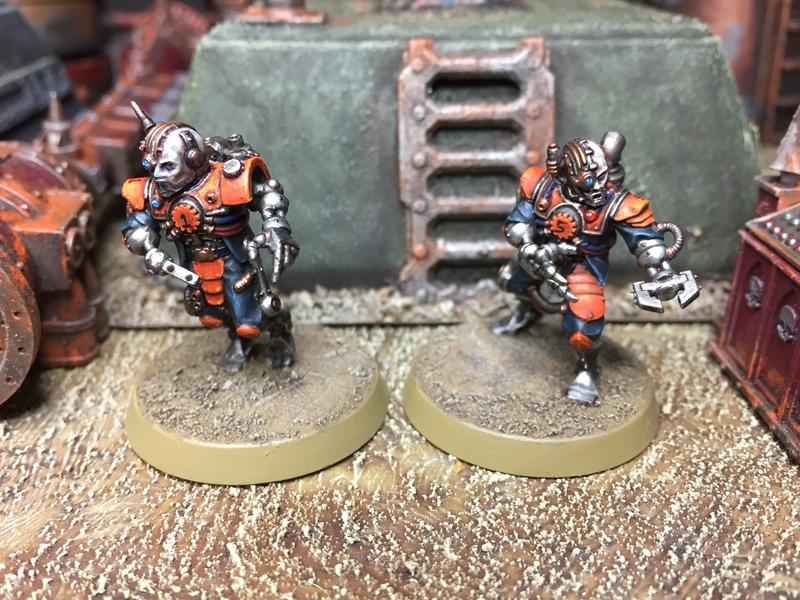 Goes to show that even GW aren’t immune to regarding servitors as space zombies. Hope the studying is going well! I know, right? 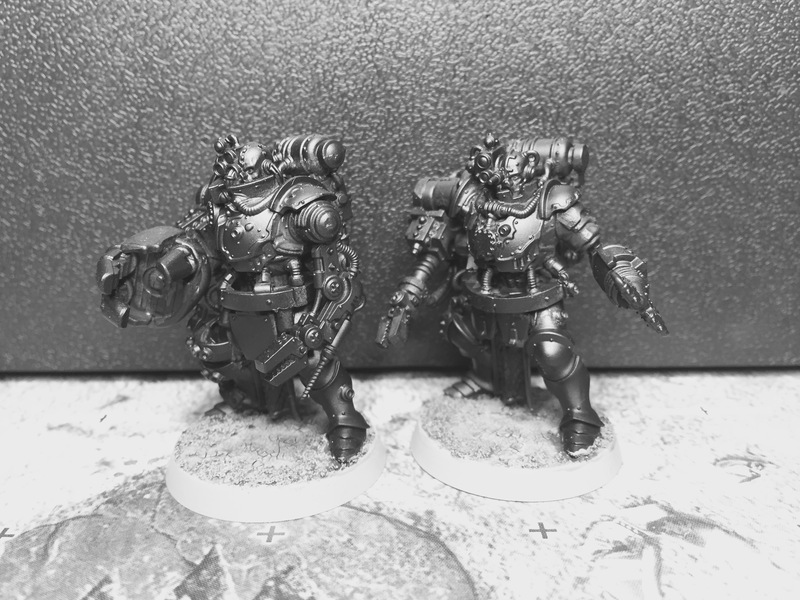 Maybe GW should do a generic servitor kit… I reckon that would sell well… converters would love it! 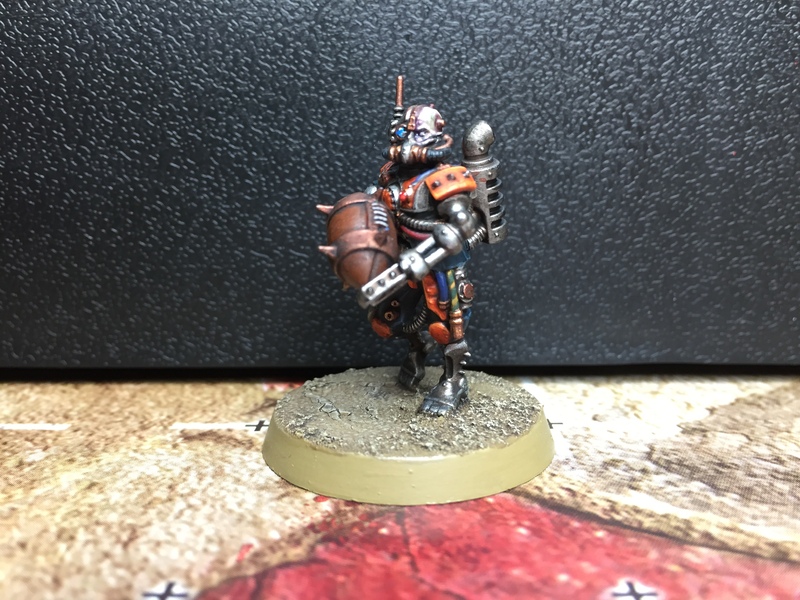 I’ve been considering a band of RT thugs to be used as an underhive BB team ! 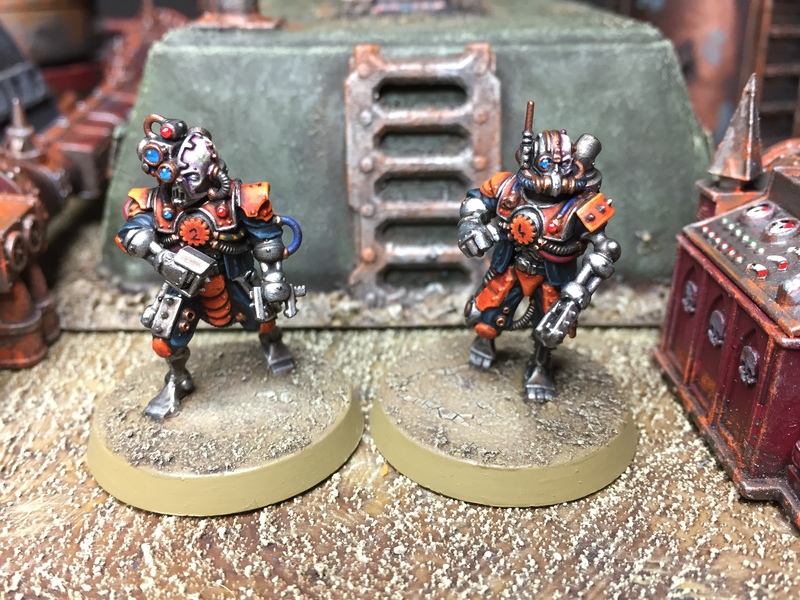 They look ace, due to both modelling and painting. GENIUS! I love the colour scheme and the whole concept. How do you make the little claws? Or are they from a particular kit? The dead eyes have been very well executed. 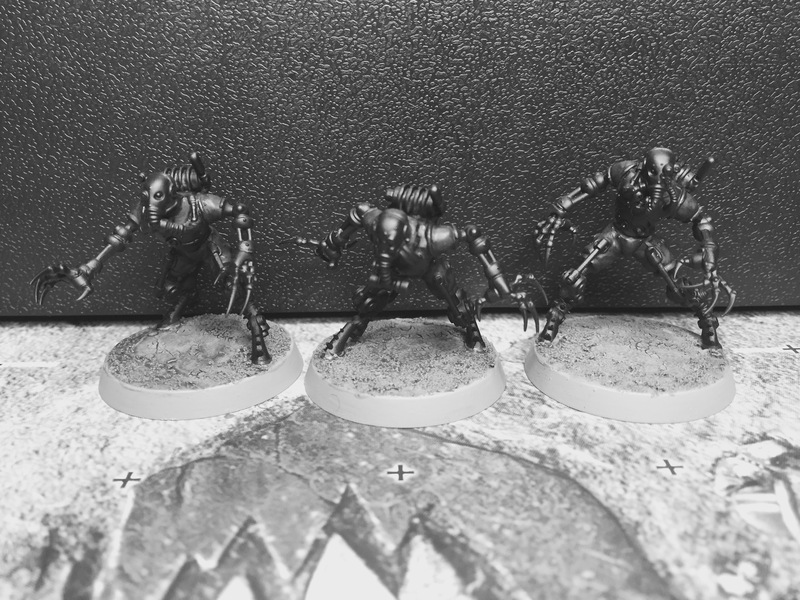 The mummy blockers look very cool and I think will be my favourites. Great “provisional” name too man. 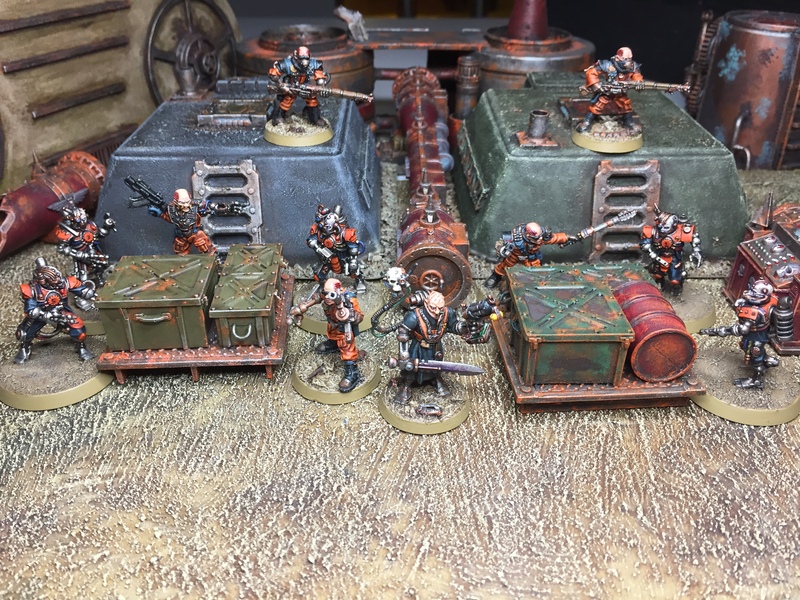 I, as others have already stated< think it's cool to have servitors as slave labour on the tabletop too. More of them I say! ;-) Cheers matey – I’ll take your word for it! Very cool, very clever! 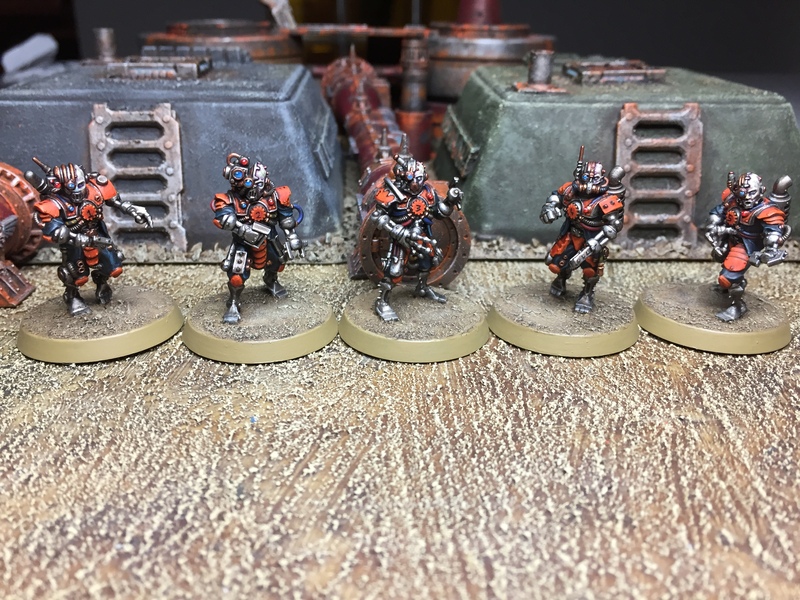 JB and I were talking about doing a Speedball / Necromunda-bowl type thing last year, and you’ve just gone and done it brilliantly already! Thanks Jon, glad you like ’em mate, and I’d be up for a game of that! You’re like: I got nothing to show. And then – BAM! So cool droids. Awesome. 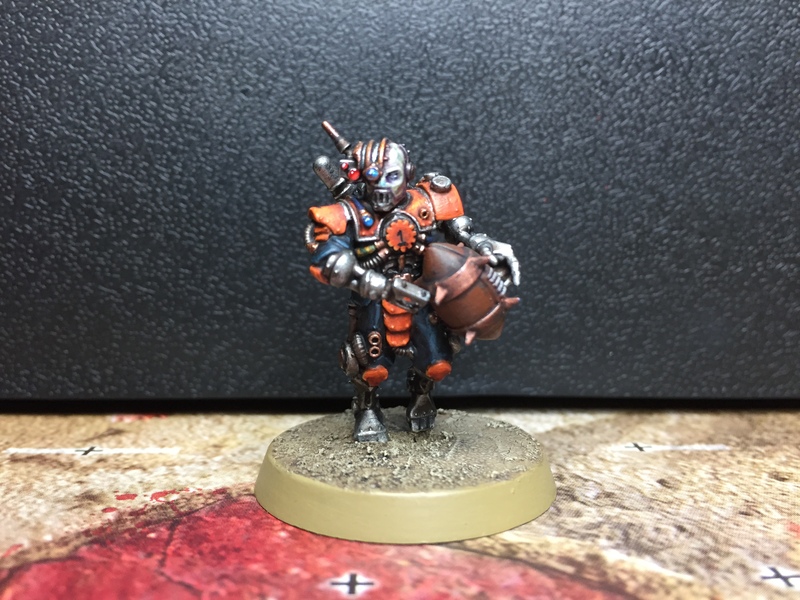 And clever blood bowl team too. Excellent work on these. 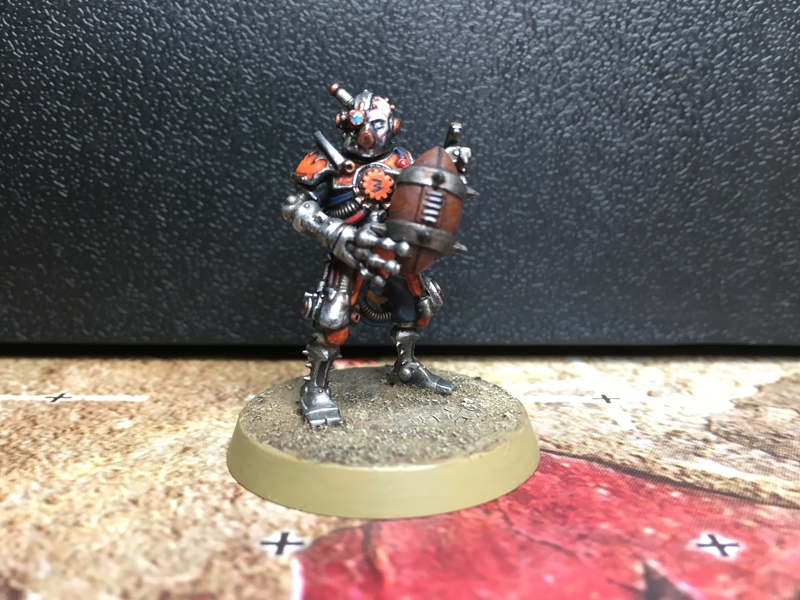 They really look the part as servitors, and the Blood Bowl Team angle is a great surprise dual-use! Excellent. 40k does need to have a crowd of servitors in the background of every scene, with some regular humans mixed in… when the shooting starts the servitors keep working while the norms panic and try to run. Exactly as I see it mate… GW should really do a menial servitor kit imo, it’d be solid gold for the kit bashers! Haha, this is so genius! Not only the fact of having servitors -which is a win by itself. But the dual use of your stuff! So cool! Great work Alex! From the lovely bright oranges to the multi-use idea, these are really lovely. 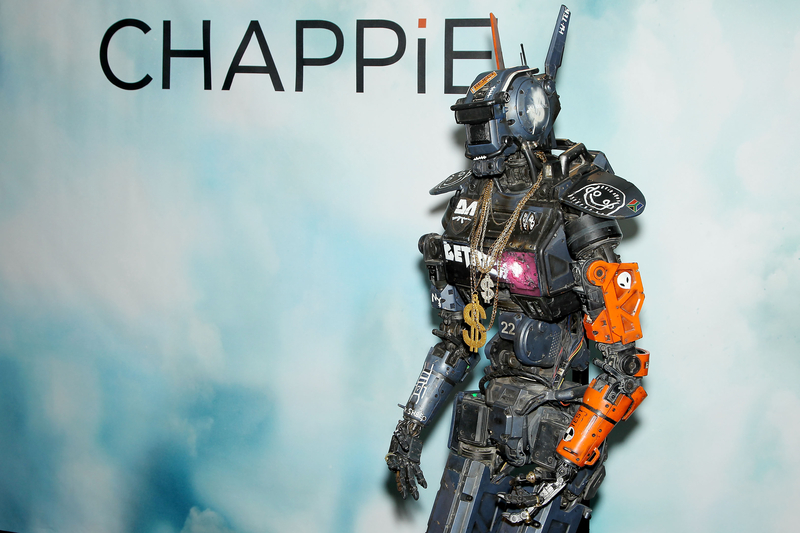 The bright orange combined with robotics always reminds me of Neill Blomkamps stuff, Chappie being a prime example (http://brainblogger.com/wp-content/uploads/Chappie-Poster.jpg). Great work on them Alex. 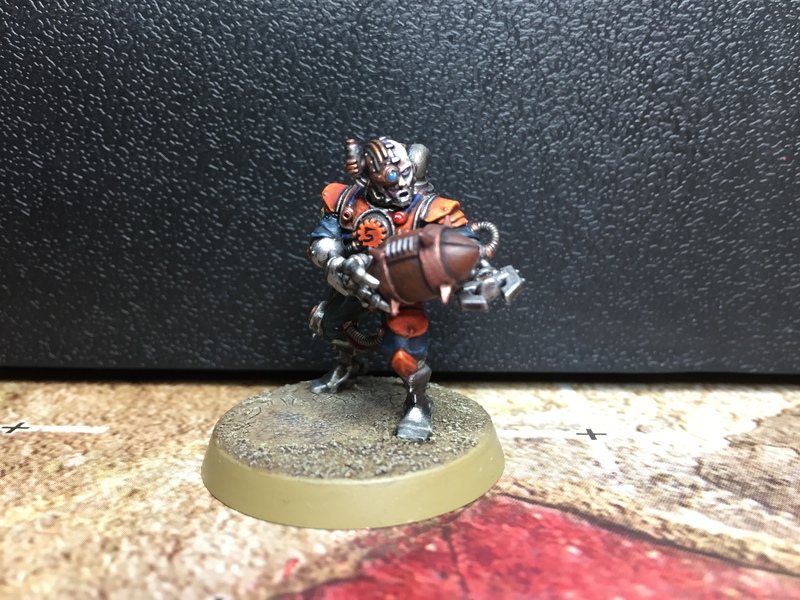 The re-use of them for blood bowl is genius and I like the different creations you plan to use for the team. Cheers Joe – time frugality is my mantra :-) I’m keeping my fingers crossed that the other positional players turn out as good! 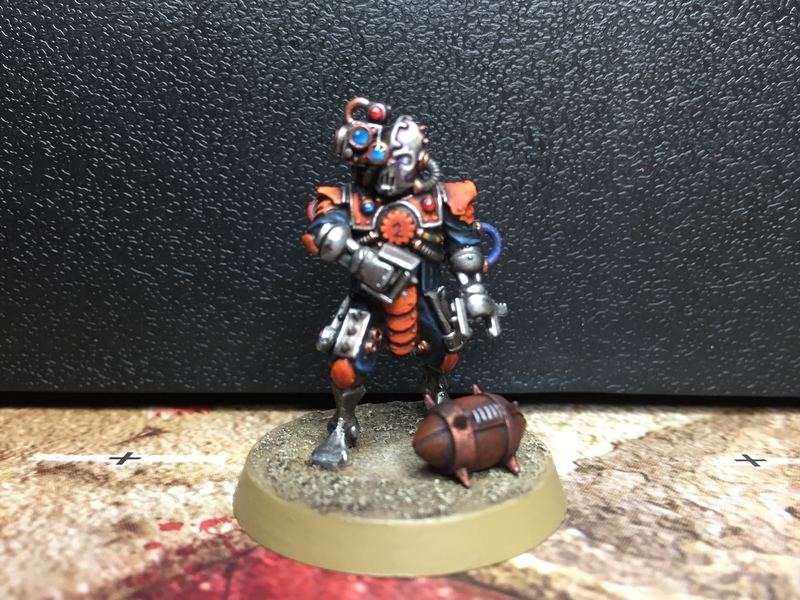 Great looking servitors and the Blood Bowl team is inspired! There is one very simple rule in life, you can’t have enough orange….. specifically that 1970s shade that was on everything from lampshades, curtains and cars and has now reached it’s apogee on creepy robo-men!